Congratulations to "Shelley P.", the winner in Leslie's giveaway. Please contact JUST ROMANTIC SUSPENSE to claim your prize! If you’ve read the first two books in my Rarity Cove trilogy, then you know Jonathan Leighton, who started out as the much older boyfriend of Mercer, the youngest sibling and only daughter in the St. Clair family. Jonathan, in fact, had been Mercer’s college professor and was nearly twice her age. The close-knit St. Clair family wasn’t happy about Jonathan initially, but by the second book in the series, they had warmed to him. Mercer and Jonathan had also gotten married. Because Jonathan was a nice guy and family member, killing him off hurt, but it was also a necessary part of Mercer’s story arc and one that I’d planned to pursue for a while. Her story in In Dark Water (Rarity Cove #3) begins a year after Jonathan’s death, with Mercer giving her late husband’s ashes to the sea as he had requested. The book’s opening is heartfelt and somber, but then things explode. While sentimentally revisiting the places she had gone to in nearby Charleston with Jonathan, Mercer becomes the lone eyewitness to a double murder. This also brings Charleston homicide detective Noah Ford into her life. Noah isn’t thrilled about his witness being part of one of the South Carolina Lowcountry’s wealthiest families. In fact, it’s a real complication. Things go from bad to worse when the eyewitness’s identity is leaked and the killer targets Mercer to keep her from testifying against him. As the story unfolds and the danger escalates, Mercer also struggles with guilt caused by her growing attraction to the tall, dark, handsome—and rather intense—detective who has become her protector. Throughout the trilogy, Mercer has been one of my favorite characters to write, and it was satisfying to give her a high stakes storyline of her own, even if I had to kill someone off in the process. Was it Stephen King who said “kill your darlings?” Or was he quoting William Faulkner? Either way, I don’t think that’s what was meant by that writerly advice, but just the same, I did it. Would you like to get to know the St. Clair family? I’m giving away the entire trilogy in e-book to a Kindle user! Just leave a comment below! Leslie Tentler is the author of seven novels, including BEFORE THE STORM, LOW TIDE, IN DARK WATER, FALLEN, and the Chasing Evil Trilogy (MIDNIGHT CALLER, MIDNIGHT FEAR, and EDGE OF MIDNIGHT). She was a finalist for Best First Novel at ThrillerFest 2012, and is a two-time finalist for the Daphne du Maurier Award for Excellence in Mystery and Suspense. She is also the recipient of the prestigious Maggie Award of Excellence. She is a member of Romance Writers of America, International Thriller Writers and Novelists, Inc. A native of East Tennessee, she currently resides in Atlanta. Visit her at www.LeslieTentler.com. Giveaway ends 11:59pm EST February 4th. Due to GDPR regulations you no longer need to submit your email address in the comments. If you have been selected as a winner your name will be posted at the top of the post. You may then contact maureen@justromanticsuspense.com to claim your prize. Your email address will be shared with the author/publicist providing the giveaway. Please don't enter me for the giveaway - I have the first 2 books and will be downloading the 3rd at the stroke of midnight with a new set of fingernails to chew! Wanted to say congratulations to Leslie on the 3rd book - I just love her RS! They blend the romance and suspense seamlessly . . with scrummy heroes and heroines you root for. Thank you, Willa! You are too kind! The stroke of midnight is coming! Hi Dawn! Best of luck to you! Thanks for commenting! Dont enter me in the contest. I already have books 1 and 2 and have preordered this one. This series is awesome!! Just wanted to say, Ms. Tentler blends romance and suspense flawlessly. I read her chasing evil trilogy and really enjoyed it too. Your cover is beautiful & inviting! Hi Janet, thank you! All the covers in the series have been beautiful, even if I do say so myself. :-) The artist did a great job! Well, I just found out someone dies when I haven't read any of the books. Don t know how I missed them since I read your other work. Would still like to win. Thanks for the chance! Thank you, Jonetta! I appreciate the kind words! Hope you're enjoying Rarity Cove #3! Love all of your books!! It takes a brave author to kill off an important character in a story, especially when he or she has been the romantic interest of one the main characters in the series. It sounds like you set it up well to make the event and transition a bit more palatable to your readers. 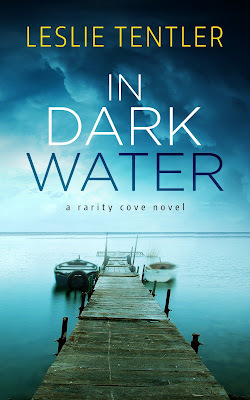 This sounds like IN DARK WATER a good conclusion to your trilogy.